G-PACT has two cookbooks currently available for purchase. Both cookbooks focus on low fat/low fiber recipes. Each recipe has been reviewed by a dietitian and nutritional information is included. was published in 2010 and includes 140 recipes for $15 US and $22 International. was published in 2013 and includes 251 recipes for $16 US and $23 International. G-PACT has a Euro Magnet available for purchase. Measures- 5" x 4" (oval). Material- 30ml thick outdoor flexible magnet with heavy duty vinyl surface. Price- $6.00 USA, $9.00 International (includes shipping). 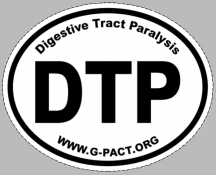 Like the stickers, this magnet is a subtle yet eye catching way to help raise awareness of DTP (Digestive Trace Paralysis) which will cling securely to any clean metal surface without damaging the finish. 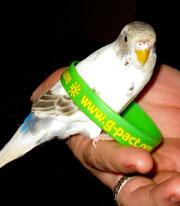 G-PACT provides awareness bands for a cost of $5.00 each. The bands are lime green with yellow raised print that says "Enlightening Others Growth Towards a Cure". We offer 2 sizes in this design: Adult; Small-boned adult/teen. G-PACT provides awareness bands for a cost of $5.00 each. The bands are lime green with yellow print that says "Rays" Awareness-Discover a Cure – www.g-pact.org and include an image of our sun logo. "Rays" from our sun logo indicates hope for a cure through the "rays"ing of awareness. We offer 2 sizes in this design: Child; and Toddler. If you prefer to pay by mail, make your check payable to "G-PACT" and mail it to 185-132 Newberry Commons, Etters, PA 17319. Please allow 3-4 weeks for your items to arrive. G-PACT maintains a store at Café Press where you can purchase DTP products like shirts, mugs, and even a teddy bear to support G-PACT and increase awareness of DTP. Multiple designs are available and new graphics are added regularly. This store is located at www.cafepress.com/gpact.